Cleansing toner for normal, dry and sensitive skin. 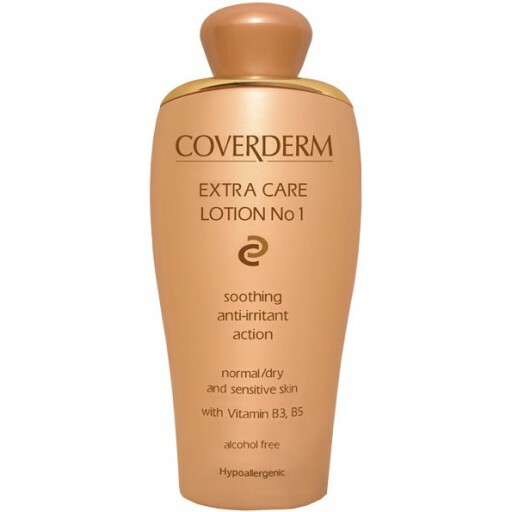 Coverderm Extra Care Lotion No 1 soothes, calms and moisturises the skin, leaving a wonderful feeling of freshness and softness. Ideal for sensitive skin due to its anti-irritant action. With Gingko Biloba and Ginseng herbal extracts. Alcohol free and hypoallergenic. 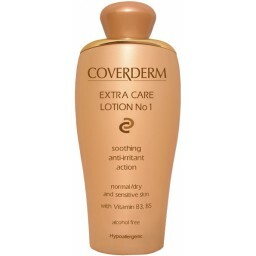 Coverderm Extra Care Lotion 1 soothes, calms and moisturizes, leaving the skin with a wonderful feeling of freshness and softness. Additionally, it offers anti-aging and regenerating action. Soothing and moisturising. Has helped to minimise pores. Great for sensitive skin.